Backrest cushions are not supplied as part of the pack and must be ordered as an optional extra. All tube 35mm unless otherwise stated. Bolt holes are drilled to fit M8 bolts. RAL colour options are available for polyester finishes on request. When ordering custom RAL colour options please expect 7-10 day delivery. 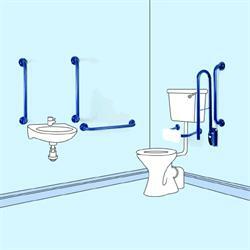 Be the first to submit a review for the Doc M Corner WC Pack (3 rail pack 760) Stainless Steel.